January 20. Twenty-nine members competed for the 2015 Developer’s Cup. 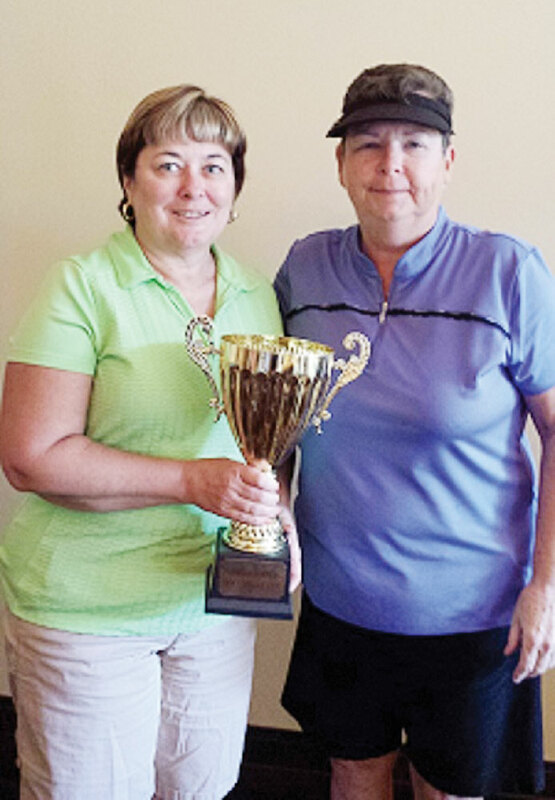 Congratulations to Mary Syer who shot a net 63 to capture the cup. Winners: Flight 1: 1st Kathy Holwick, 2nd Lorna Watts, 3rd Candy Burtis; Flight 2: 1st Jean DeChristopher, 2nd Susan Worner, 3rd Cindy Jensen; Flight 3: 1st Dee Lee, 2nd Pam Mumy, 3rd Judy Brozek; Flight 4: 1st Cheryl Babb, 2nd Karen Burke, 3rd Nancy Kraus. Combo KP, Patty Bruchez. Plum KP Dee Lee. This was also the second of four state medallion qualifying dates. January 27. Postponed due to rain. February 3. Forty ladies made up 10 teams of four and counted one best net score on par 4s and 5s and all four net scores on the par 3s. Winners: 1st, Sherry Ameling, Shirley Eliuk, Fran Fowler and Dell Hoff; 2nd, Judy Brozek, Margaret Erickson, Jeri Srenaski, Susan Worner; 3rd, Patty Bruchez, Debby Harris, Jan Stocek, Lorna Watts. February 10. Past President’s Classic (formerly the Fortune Cookie Classic). Joanne Heiman, Sue Waibel and MaryLou Walton, RRLGA past presidents, used “Life is a Beach” theme for the first Past President’s Classic. 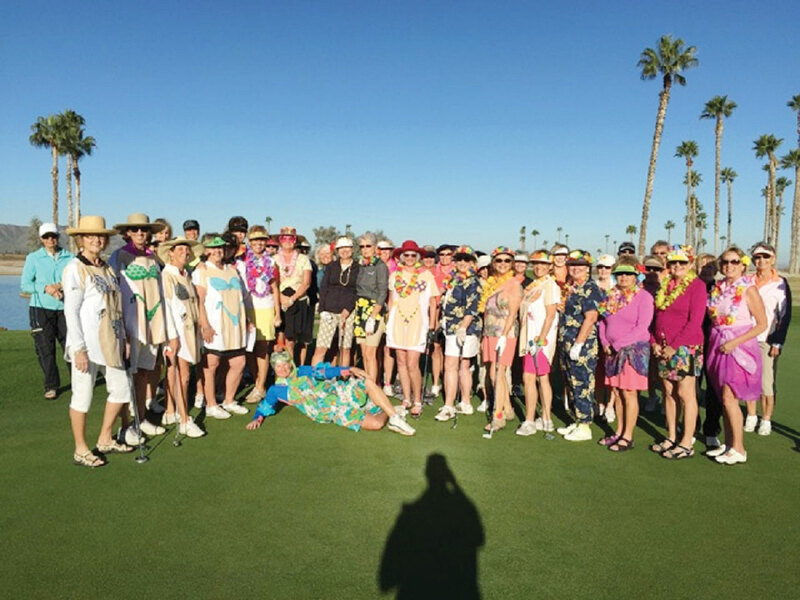 Members picked their own four-person team for this fun tournament, and many ladies dressed in their finest beachwear for the event! After the teams completed each hole, they found unique information on the next tee that stated whose score(s) to use. Members enjoyed cheeseburgers, chips and watermelon for lunch afterwards. There was information about 18 different world-wide beaches on which the members were quizzed, and teams were given awesome beach names as well! Winners: 1st, “Bikini Babes” Sherry Ameling, Debbie Hatcher, Brenda Wedin; 2nd, “Beach Babes” Patti Baumann, Chris Clark, Barbara Gayer, Jeri Srenaski; 3rd, “Beachcombers” Cathy Edge, Fran Browe-Schwartz, Marcia Tiefenthaler, Adele Wolyn. KP – Fran Fowler no. 6 and Terry Fondurulia no. 17. Best costume, Cindy “Scuba Diver” Jensen. Most used score in their team, Laurell Graf. Most shark-infested sand bunkers, Carol Ilten. Quiz winners, “Beach Blanket Beauties” Brenda Amens, Laurell Graff, Nancy Kraus. A special thanks to Marylou, Sue and Joanne for making this such a great tournament. Fun was had by all, and we can’t wait until next year! January 19. Robin Barber, Patty Bruchez, Candy Burtis, Karen Connell, Jean DeChristopher, Shirley Eliuk, Pat Linderman, Lorna Watts played against Ahwatukee at Coyote Run. January 26. Robin Barber, Karen Connell, Shirley Eliuk, Fran Fowler, Cindy Jensen, Bobbie Johnson, MaryLou Walton, Lorna Watts. February 9. Patty Bruchez, Karen Connell, Jean DeChristopher, Fran Fowler, Kathy Holwick, Cindy Jensen, Bobbie Johnson and Lorna Watts played against Foothills at Ahwatukee. Upcoming Events: Member-Guest Tournament March 9-10; Club/flight championship March 30-31.